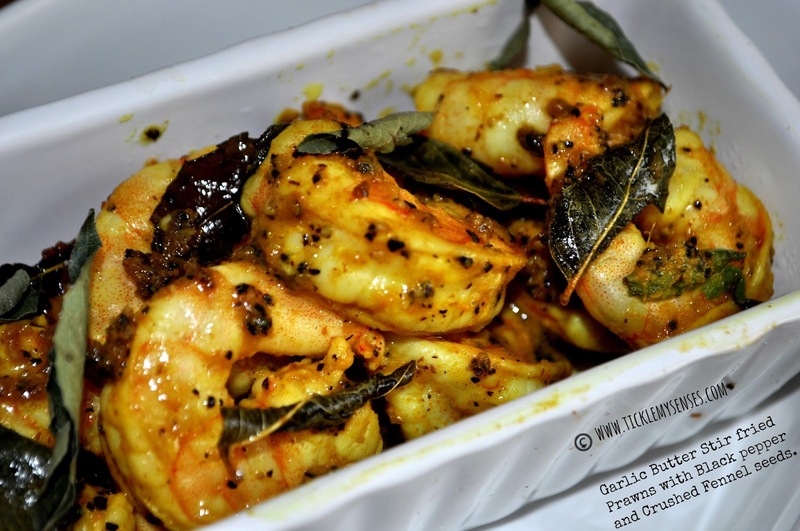 Tickle My Senses: Garlic Butter Stir fried Prawns with Black pepper and Crushed Fennel seeds. I have been upto my ears the past couple of weeks, its been so hectic, my life has been swamped with household chores, a couple of house get togethers, cooking cooking more cooking and a teeny bopper whose been testing boundaries. Well I am so pleased to now say that the busy period is over for now, the dust has settled, the lil one is asleep and I finally have found the time to put my feet up and do one of the things I enjoy the most....BLOG!! So with a Smile on my face I give you todays recipe, a simple and delicious prawns stir fry thats bursting with flavours of butter, garlic, curry leaves, freshly ground black pepper and crushed fennel seeds. This dish needs hardly any preparation. Only cleaning the prawns and pounding a few fennel seeds. The rest is just putting things together. The crushed fennel seeds adds a wonderful dimension to the prawns. Do try it out. Its Yumm!! 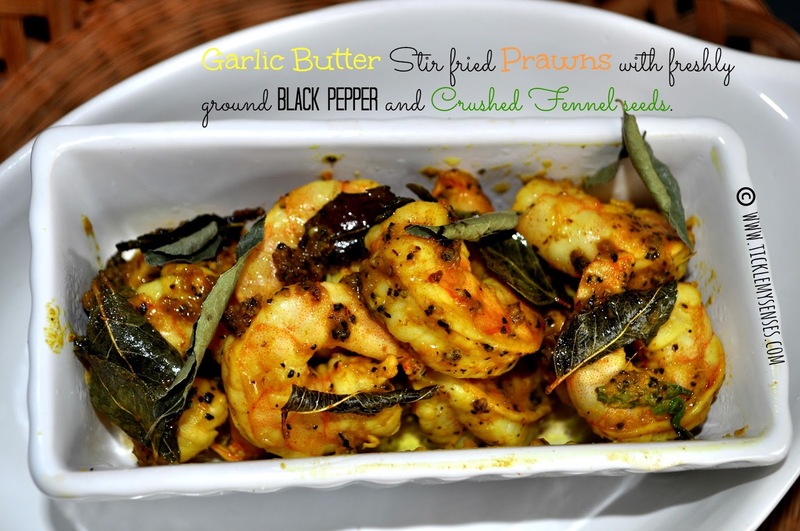 Tender juicy prawns thats first marinaded, then quickly stir fried in butter thats flavoured with pureed garlic and fresh curry leaves, then delicately spiced up with freshly ground black pepper and crushed fennel seeds. 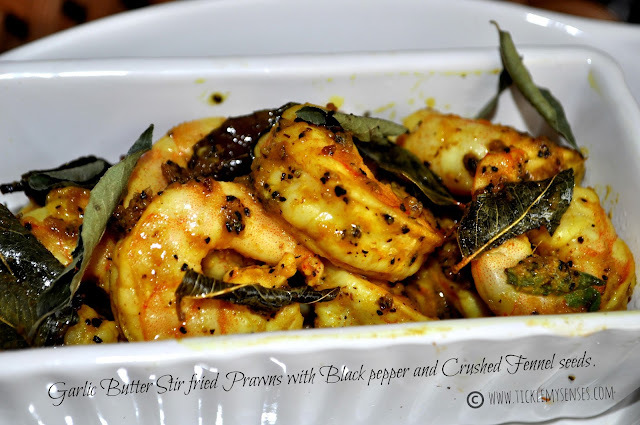 To Make Garlic Butter Prawns with Black pepper and Crushed Fennel Seeds. Butter/ Olive oil : 2-3 tbps. 1. In a bowl take turmeric powder add 2 tbps of lemon juice and salt to taste. 2. To the marinade add the cleaned and deveined prawns. Let it marinade for at least 20 minutes. 3. In a large non stick pan melt butter. Once the butter starts bubbling add the curry leaves fry till the leaves changes colour (1 minute), add the garlic paste and stir fry on a low flame for 3-4 minutes. Turn up the heat to a high flame add the marinaded prawns one by one to the pan without the marinading juices, lay the prawns flat without crowding the pan. As soon as the prawns starts changing colour to pink on one side flip the prawns over to the other side to fry. Frying the prawns shouldnt take more than 3-4 minutes in total. Once both sides of the prawns have turned pink sprinkle over the black pepper and crushed fennel or saunf powder. Add a dash of lemon juice if desired, toss well. Stir fry another 30 seconds then take the pan off the heat. Serve the prawns hot as a starter or as an accompaniment to a main meal.